This is my guide to the Leeds & Liverpool Canal. This site has hundreds of annotated photographs which I hope you will find interesting whether you enjoy walking, cycling or just taking a virtual trek along the towpaths of Britain's canals. 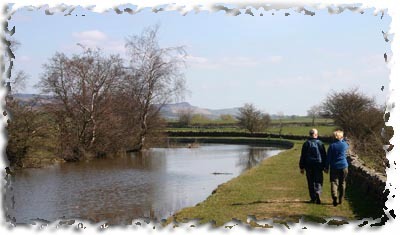 Towpath Treks has plenty of information, maps and advice on cycling and walking along the Leeds & Liverpool Canal. But if you prefer we have the canal pub guide for pubs on the canal. Towpath Treks also has the most comprehensive survey of mileposts on the Leeds & Liverpool Canal there is online. The site also covers other canals that are favourites of mine, the Tavistock, Bude, Regents Canal and Shropshire Union canals and more. Interest in the Leeds & Liverpool Canal is growing, more people are walking and cycling along the towpath than before. Leeds has undergone regeneration around its end of the canal. The eastern end of the Leeds & Liverpool Canal has some great walks, the famous Bingley Five Rise, the historic towns of Skipton and Saltaire and the Leeds Armouries. Liverpool has seen a lot of changes in the last few years. The canal link allows boaters to sail along the Pierhead past the famous 3 Graces and into the south docks. Boats now moor next to the new Liverpool One shopping centre a short walk from the city's many museums and galleries.